Update 25 June 2015: Available for download now. In the olden days, Apple added the Dashboard to Mac OS X. It had lots of potential — widgets to quickly give you information or make simple calculations — but it stagnated and then has pretty much gone in Yosemite (10.10). By and large it has been replaced by the Notification Centre. I wouldn’t mind so much, but there’s one widget that I use all the time: a simple monthly calendar. It didn’t link to Apple’s Calendar to show events or anything clever. It was just a quick way to work out that, say, next Friday is the 23rd or that February 24th is a Tuesday. And, oddly, it’s not there in the Notification Centre. There’s a list of todays events. There’s a list of your reminders. There’s what’s happening tomorrow. The weather. But not a simple calendar widget. Well, now there is. Or at least, will be soon. 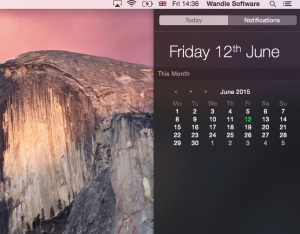 I’ve submitted my Mac calendar widget to the Mac App Store and, with luck, it’ll be available soon.. It will be free but we accept donations right inside the app if you’d like to support us and help us product future updates.